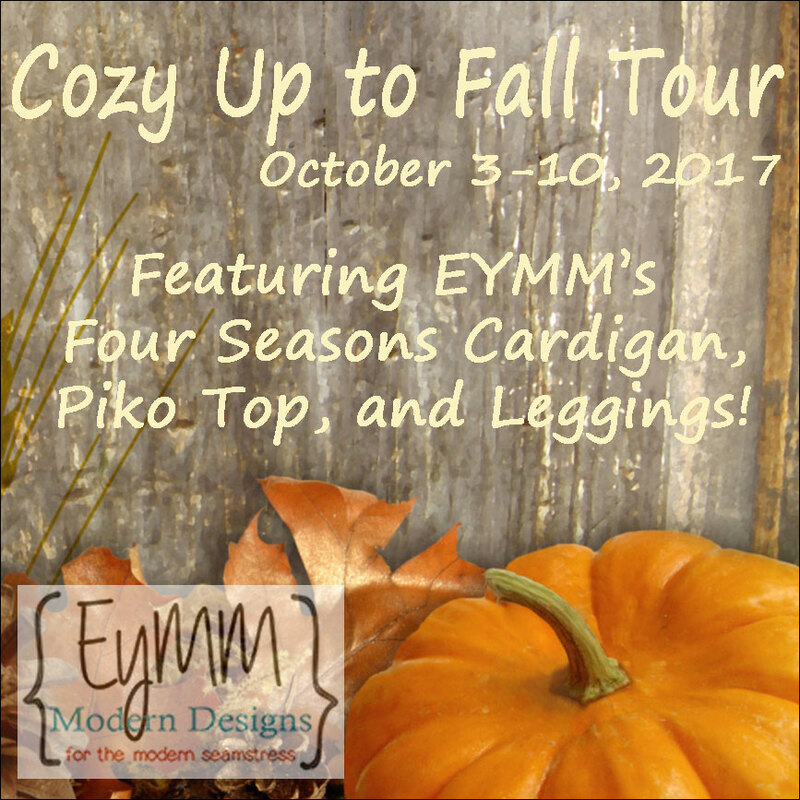 Welcome to the EYMM Fall Tour! The lovely thing about this tour is that Kymy, the EYMM owner and designer, has given a $20 store credit for me to pass on to one of my readers. To enter this giveaway, please make a comment. If you are new to my blog and you’d like to sign up, I’d love you to! I will need your email addresses to contact the winner. Links to all patterns are at the bottom of the post. I have also started Chiropractic treatment and much as the Chiropractor is discrete, wearing a skirt when your knee is pushed up around your chest can lead to a world of impropriety! I hate wearing structured pants and find leggings more comfortable. I also hate the initial stages of making any pattern. I sew to have clothes fit me properly; part of that process is adapting the pattern to my shape. It’s never an easy start but is so very worthwhile when its done. Piko style tops have been all the rage this summer. I didn’t think the Piko Top would suit me as I have curves, and it is frankly, a Potato Sack shaped top. While its a great loose top, it did nothing for me. After trying on my finished article, which I will spare you the photos of, I cut out a lot of fabric using my trusty French Curve. I thought it looked ok until my husband looked at me and said, “Wow. Will you wear anything that baggy?” I expect I might take some more volume from the sides but for now it is a loose, very comfortable and warm top. It will be great for layering in our chilly winters. Don’t be put off as there is a great pattern hack on the website. When I read ‘compression leggings’ I had a few worried thoughts. If my body is compressed somewhere it is bound to leak out elsewhere. I was imagining mega muffin tops!! Imagine my relief when that wasn’t the case. I liked the leggings so much that I made them twice: as shorts and as leggings. Previously if I am honest, I have always made PegLeg Leggings; I am now a convert to the Get Moving Leggings, and hope they get me moving! I added 3/4″ to the body, then 2″ to the legs (yes, even the shorts). I also merged sizes as my waist seems to have gone on a permanent vacation. I didn’t add the little gusset as didn’t need it. There was plenty room for my booty and I feel that particular part of me is pushed up pertly! Don’t discourage me now – please! These leggings are super comfortable, so much so I was wearing the shorts (which were my muslin) round the house all day. I didn’t want to show off my pasty legs so you are treated to my red legs instead! I made the full length leggings in a super tight sparkly fabric. For those who have read my blog before I used the same compression type fabric to make the EYMM Essential Undies. I’ve already washed some lovely green cotton lycra for more leggings. I think they will make great PJ pants in a lightweight fabric. Thanks for dropping by and please follow the links to the other bloggers for their perspectives. As I said above, leave a comment to be entered to win an EYMM $20 store credit. During the tour,�all featured patterns are on sale (save even more by buying the youth/adult bundles!) …�the Four Seasons Cardigan (both women’s and girl’s), the Piko Top (both women’s and girl’s), and the Leggings Bundle (‘Get Moving’ Leggings for women and Jocelyn’s Leggings for girls). Use coupon code FALL17 to save 30% off these 6 patterns and/or 3 bundles in the EYMM shop, but only until 11:59pm on October 11, 2017. Such amazing work! It’s good to see you are beginning to get out and about again! You are too cute and funny, “potato sack shaped top”. I chuckled, but I agree and understand. I do like the color on of the top on you and your bum, looks awesome! Great job! The pattern does describe the top as a potato sack. fantastic. i love your honesty and the leggings and top are super cute! Peg Legs seem to the rage in some groups. I’ve not tried them, but I will try these instead! I don’t know if I need the gusset, but when making volleyball shorts, those seem to be a must. My daughter is always saying she needs more shorts. I’m not sure what she’s doing with them. I love that you can take a pattern and make it just right for you. That says a whole lot for the initial pattern. It is a brilliant pattern. Go buy it while it is on sale! The grey top is actually a bought one to see if the style suited me. EYMM doesn’t currently have a cross over pattern, but I really like the Jocole Cross Over tunic and dress. 5 Out of 4 also makes some great cross over tops. Never be afraid to measure the pattern when you lay it out and compare it to your measurements. Good luck! too funny. I actually use a narrow width zigzag a lot on leggings. Having a sharp Serger knife at junctions can be disastrous! Looks great! Happy thanksgiving to you too! I love the cute color blocking on your pants/leggings!! Times to look up that pattern for sure. Totally just bought the leggings Pattern! Thank you! What a great read! Made me laugh a couple of times. You look great though. I’m going to look into the leggings pattern for my daughter cause I don’t think I have one that she likes. Great post! I love leggings, but I haven’t made any!! You are the lucky winner in my little giveaway. I have emailed you and passed your details along to Joelle at EYMM. There is now no excuse not to make the leggings! I actually really like the piko top, I love that style, and I think the photo of your adjustments is really flattering on you. the leggings are cool too in the two colours. You are so great ❤ I love your potato sack top, that pink fabric especially looks comfy! I don't mind the leggings pattern I have now, but you're a good saleswoman – those look good! Lovely work! I’m with you…the initial work I put into getting patterns printed, taped, adjusted, sewing up muslins…I hate it! But the end results are well worth it. Lovely leggings! I love the top too, but I’m a big fan of flowy tops 🙂 I think it looks lovely on you! Happy to have found your blog! Very nice, I’ve only made peglegs so far. What do you like better???? Love your blog. Just accidentally found it searching for a fabric store here in Nome, AK. How do I follow you? Just on WordPress or do you have a link? What a lovely compliment. Thank you so much. I am just on WordPress. There should be a ‘follow’ link at the bottom of the post.